Cabrillo College hosted a one-day Reading Apprenticeship event on October 23. With student learning and success on our minds, and a beautiful view of the Pacific Ocean in our sights, attendees spent the day learning how to invite our students into Reading as problem-solving through the Reading Apprenticeship framework. Over 30 participants joined us from 4 different community colleges and represented 12 disciplines: English, Reading, Anatomy, Communications, Early Childhood Education, Math, Anatomy and Physiology, ESL, Biology, Philosophy, History, and Library Sciences. 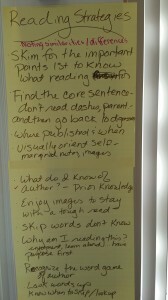 Attendees learned about core Reading Apprenticeship routines like the Reading Strategies List pictured above. Reading Strategies Lists help demystify the reading process, invite students to consciously read for understanding and surface behaviors of effective readers.